In the traditional partition of Rome into rioni, the area around Monte Testaccio was included in Rione Ripa. It only became a separate rione in 1921, in recognition of the large increase of its population. The meadows around the ancient Roman dumping ground were chosen by town planners for the development of a new quarter aimed at providing an inexpensive accommodation to citizens belonging to the working class, in part expelled from their homes in the more central rioni, in part coming from various Italian regions. A net of perpendicular streets with large, tall buildings replaced the meadows which had seen some of the most popular aspects of the Roman carnival, including bullfights. Outside the carnival period the meadows were used for pasturing cattle and sheep. 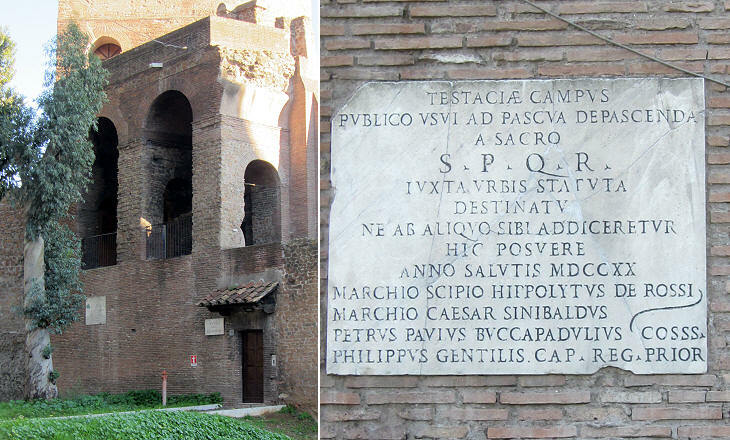 A 1720 inscription at Porta S. Paolo reads: Testaciae Campus publico usui ad pascua ... (the fields of Testaccio - are devoted - to the public use for pasturing ..). For this reason the meadows were called Prati del Popolo Romano (to distinguish them from Prati di Castello). 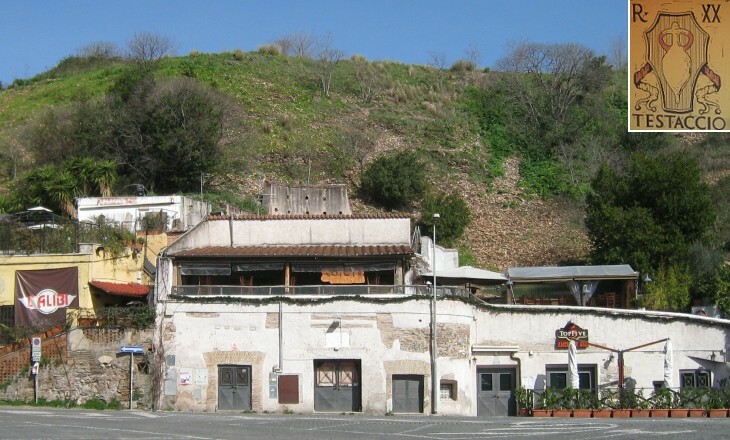 Monte Testaccio, with its excavated caverns housing rowdy wine bars and stables, was not touched by the development of the new quarter and its inhabitants were proud of the new rione symbol, a testae, the amphorae used by the ancient Romans to contain wine and oil. Main square of Testaccio with the fountain which is the symbol of the "rione"
Monte Testaccio is entirely composed of fragments of broken earthenware coming from the large horrea (warehouses) next to the river harbour where the immense provisions of commodities required by Ancient Rome were unloaded. In 1870 Pope Pius IX celebrated with an inscription near the river the first excavations in the area: it is most likely the last inscription he placed in Rome, because in that same year the city was conquered by the Italian troops. The sarcophagus is a 1940s addition when the street along the river was redesigned. 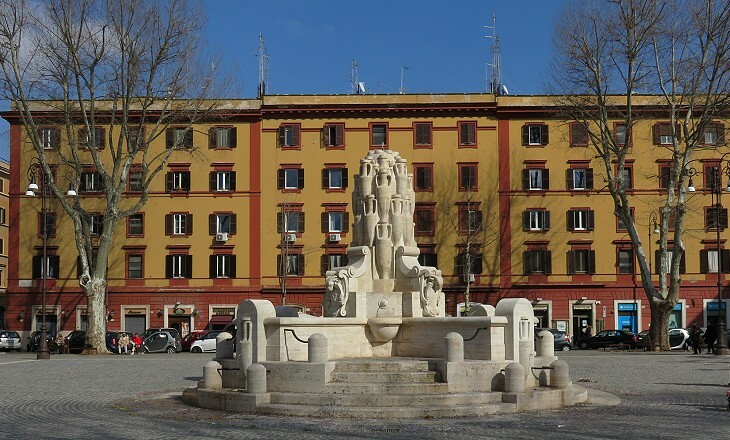 Several modern fountains of Testaccio make reference to the rione symbol. In addition to fragments of pottery, the ground of the former meadows covered other memories of Ancient Rome; this explains why several modern buildings of Testaccio display minor decorative elements and parts of buildings. Also the parish church of Testaccio is in a way linked to Ancient Rome: S. Maria Liberatrice bears the name of one of the first churches of Rome, located in the Forum. 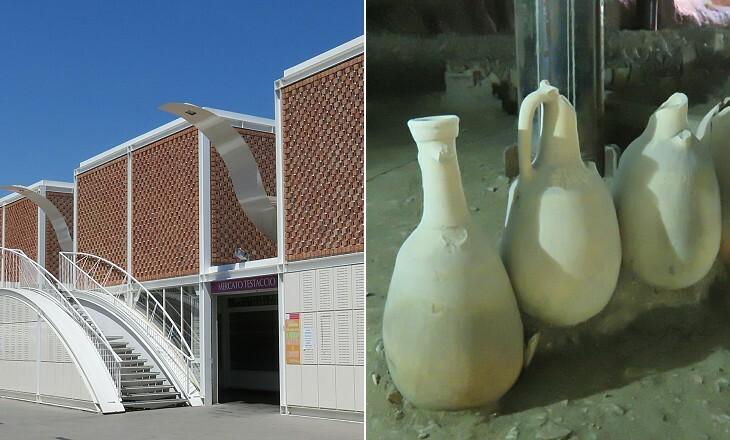 Findings during the excavations of a modern marketplace have revealed that not all the pottery containers were thrown away. Some of them were used by masons to lighten the weight of vaulted roofs (as at Circo di Caracalla) or to make opus signinum, a building material made up of pottery broken into very small pieces and mixed with mortar. It was named after the town of Signia. It formed a cement which was used for floors and surfaces which needed to be waterproofed. Archaeologists believe they found the warehouse of an opus signinum factory. Testaccio is best known by Romans because of its distinctive style of cooking, rather than because of its broken pottery. Between 1888 and 1891 a modern slaughterhouse and a cattle market were built between Monte Testaccio and the river. Scraps from the slaughtering process were taken home by the workers, most of whom lived in the new quarter or given for free to the owners of the inns who catered for porters and drivers who for business reasons came to the slaughterhouse. 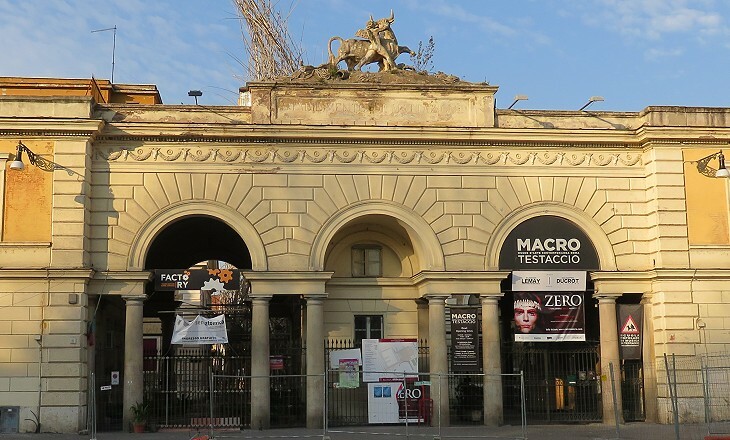 Over time some recipes became broadly popular and today, even though the slaughterhouse was relocated elsewhere in 1975, the restaurants of Testaccio remain among those the Romans prefer when they dine out (which they do quite often). Testaccio has some interesting examples of the architectural trends prevailing in Rome during the Fascist period (1922-43). 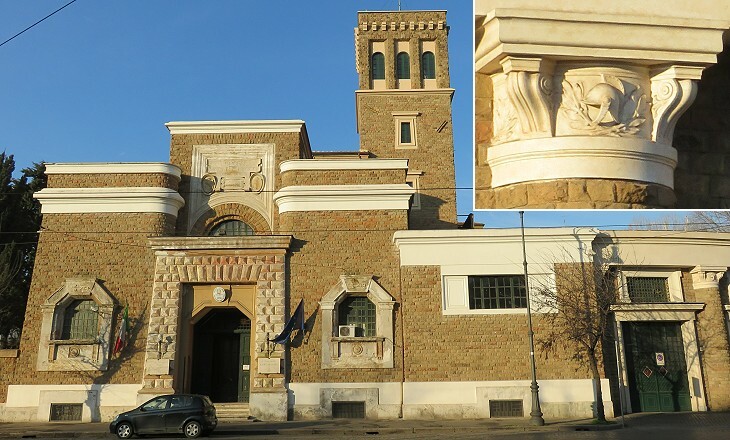 This fire station designed by Vincenzo Fasolo and completed in 1929 assembles elements of classic and medieval styles, with even a touch of Ancient Egypt in the design of doors and windows. 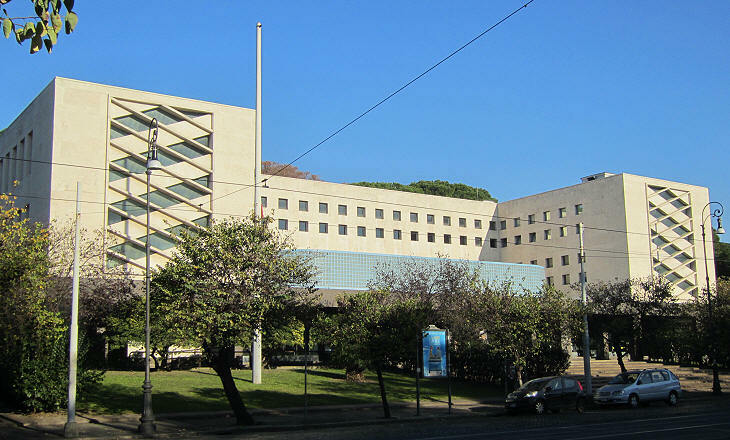 The members of the commission appointed by the Post Office to choose the winning projects for 4 new post offices to be built in new quarters of Rome, had very different views from those who chose the project for the fire station. The post office of Testaccio was designed by Adalberto Libera and Mario de Renzi in 1933-35 and it shows the acceptance of the modern "rationalistic" style, initially developed in Germany. Many foreign travellers visit the Protestant Cemetery of Rome attracted by the accounts written by Goethe, Henry James, Howells and others. Few of them know that across the street many other Englishmen rest in peace. Some 500 soldiers and officers belonging to the various countries being part of the British Commonwealth were buried in a piece of land next to the ancient walls, which was donated by the City of Rome. Approximately 50,000 Commonwealth soldiers fell in the WWII Campaign of Italy. Testaccio offers a fine view over the southern flank of the Aventine hill and in particular over Bastione della Colonnella, a fortification built by Antonio da Sangallo at the request of Pope Paul III (1534-49), who had in mind to strengthen and redesign the walls of Rome (see also Bastione del Sangallo). The large medieval looking church shown above is part of a large Benedictine monastery built between 1892 and 1896 on a piece of land donated by the Knights of Malta.